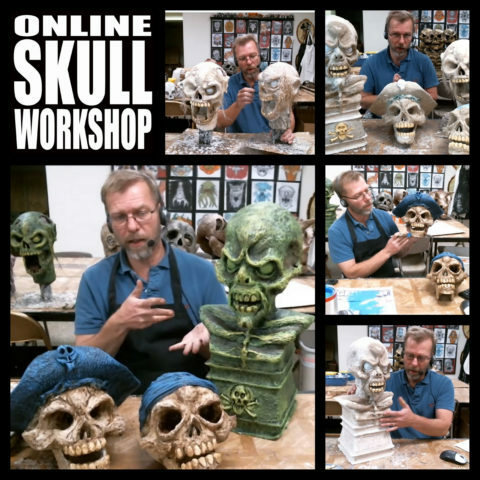 We are thrilled to re-introduce the STOLLOWEEN Online Workshops for 2018. 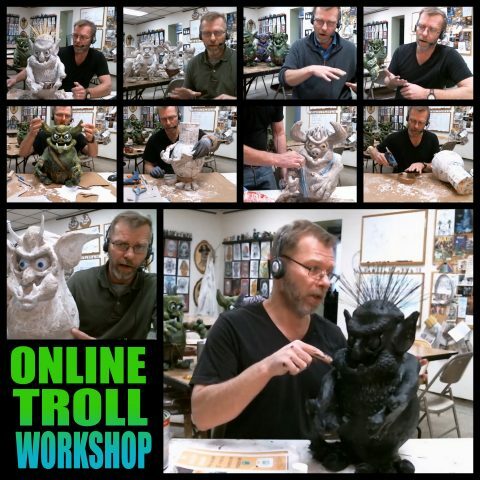 It has been about a year since we last offered Online Workshops for those unable to attend the Midland Michigan based studio workshops. In the past the Online offerings were conducted live with everyone joining the class via webcams at a specified time during the week. The Online Workshops were successful resulting in a lot of great imaginative work, but unfortunately it presented a number of problems. Scheduling difficulties due to time differences due to geographic locations, a student in Australia would need to log in at 3 am in order to participate in a class that started at 8 pm EST. The classes were live, not recorded. Students could not re-watch any of the information. Technical glitches, an interruption in internet service meant being dropped from the class. The new format offers the information in pre-recorded segments allowing users to access the information at their convenience and re-watch critical parts. The new recorded format also guarantees that all students receive the same content, we cover everything unlike in the past when I would present the information live. Complete list of tools and materials needed to complete your project. Access to six video segments totaling 5.5 hours of information. Access to a STOLLOWEEN private Facebook group composed strictly of students that have or are currently taking a workshop. Access to six video segments totaling over 8 hours of information. *Access to video segments is unlimited and will be available for as long as the Online Workshops are offered. Priority response from the instructor is guaranteed for 120 days from time of purchase. 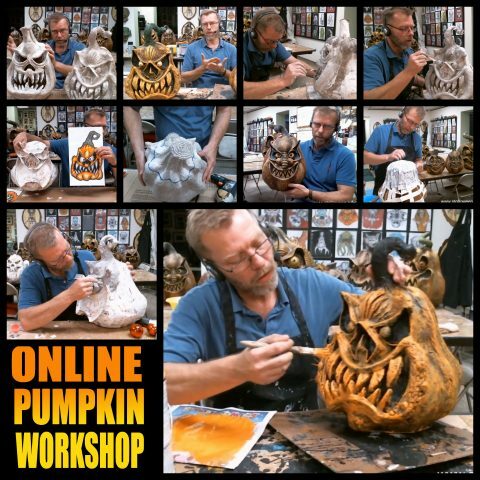 To start the registration process simply send an email to stolloween@gmail.com with “Online Troll Workshop”or “Online Pumpkin Workshop” or “Online Skull Workshop” in the subject line. Tell me a little about yourself, where you are located and why you want to take the class, etc. I will then send a payment request and after payment is received I will send all the course materials, templates and links. When it comes to the video segments you can view them in whatever manner works best for you. Watch all the sessions before starting work, watch the first session and do the work, or work along to the video. We all learn in different ways so do what works best for you. My weekly schedule is always hectic and unpredictable so please give me 24 hours to respond to any request or questions. The cost of the workshop is $75.00 USD, that is 75 bucks in U.S. currency. I will send a payment request to your email which will allow you to pay via credit card, debit card or paypal. Once your payment has been received I will send the course materials and links and we will start the 60 day clock. 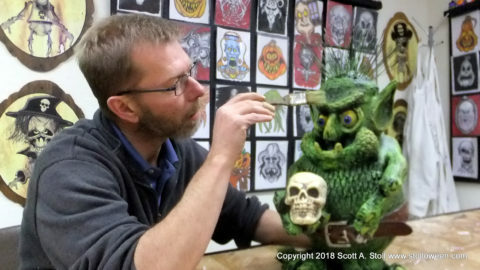 When I teach these workshops in the studio the students have 12 hours to complete the project so I would plan on spending about 20 hours working on your projects in addition to the time needed to watch the videos. Thanks for taking the time to read this and hopefully we can work together in the future and create something great. Any information and materials presented in this workshop were developed by Scott A. Stoll and are intended for private and non-commercial use. Public performance or sharing of this information is strictly prohibited. You agree that the use of this information and content contained herein is at your own risk and there is no warranty expressly made herein.